“Black Mirror” (2011-) fans across the globe could hardly wait for the year-end release of the show’s fourth season and were far from disappointed. (This reviewer binge-watched all six episodes over the course of a single weekend.) However, one of the darkest and most discussed episodes to date is Season 3’s “Shut Up and Dance,” featuring the incredibly awkward yet amazingly talented Alex Lawther. Indeed, Lawther delivered such a fantastic performance that when it was announced that he was to star in the U.K.’s new dark comedy series, “The End of the F***ing World” (2017-), true “Black Mirror” fans starred its Netflix release date, Jan. 5, on their calendars. 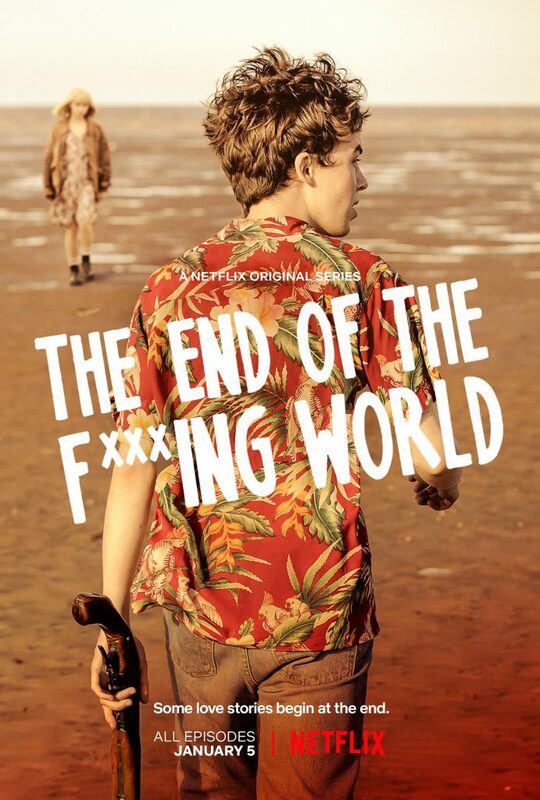 Upon first inspection, “The End of the F***ing World” does not seem to have much to offer. With only eight episodes, each only about 20 minutes in length, one could easily make the mistake of dismissing the show without giving it as much as a second glance. However, the brevity of the series is not due to missed opportunities, but instead it is the result of the flawless culling of anything that does not advance the humorous yet heartbreaking journey of the pathetic heroes. Nevertheless, each episode is so emotionally burdensome that it is almost impossible to watch even two in the same sitting, allowing viewers to devote more time and energy to ruminating on each individual episode. In other words, this show is much more enjoyable if not binged. The show wastes no time in introducing its two protagonists. The very first shot is of Lawther’s character, James, who sits alone in the dark, staring broodily into the distance. In voice-over, he apathetically states, “I’m James. I’m 17. And I’m pretty sure I’m a psychopath.” The son of an (apparently) absent mother and a misunderstanding father, James’ right hand is covered with burn scars from when he was younger and stuck his hand in a deep-fat fryer just because he “wanted to make [him]self feel something.” Further evidence of his psychopathic nature includes his utter lack of humor and his constant desire to punch his dad in the face. James has loved hunting and killing animals since childhood, but now he longs the thrill of chasing … larger game. Enter Alyssa (Jessica Barden). With an abusive stepdad and a distant mother at home, and no real friends at school, Alyssa craves love and adventure. James initially intrigues her because he looks as lost and out of place as she feels; little does she know that he secretly dreams of murdering her in cold blood. However, after only a short time together, they realize just how well they truly understand each other. And with just enough encouragement from Alyssa, James gives his dad a farewell knockout punch before the two rebels leave their old lives behind forever, with nothing but a need to escape to lead them on their way. The motif of voice-over is essential to the arc of the show. Though both characters are forced to make tough choices, it is their thoughts and feelings that define them. In fact, the voice-over often contradicts what James and Alyssa say or do, almost as though each possesses a second, internalized personality. Originally, they each have completely different motives: James wants to kill Alyssa, and Alyssa wants to make James fall in love with her. Yet, the beauty of their relationship lies in their uncanny ability to appreciate and acknowledge each other’s hidden selves, to the point where they essentially become two sides of the same fight-the-system coin. No matter what obstacles they face on their journey, or the degree to which other people (and sometimes even themselves) get in their way, it is clear that they will always find each other in the end. One other feature of the show that deserves attention is the music; specifically, the one or two songs that are frequently heard throughout. Most notable is Dinah Shore’s “Laughing on the Outside (Crying on the Inside)” (1946). The soft jazz song perfectly complements the show’s darkness. Moreover, the repeated lyric, “I’m laughing on the outside / Crying on the inside / ‘Cause I’m still in love with you,” ties in well with both the humor and the hopeless romanticism both characters exhibit. At times, we may feel as though we are living in a dystopia, plagued by a constant fear and loneliness that is impossible to overcome. The lesson of “The End of the F***ing World” is not that we should pretend that everything is fine and be grateful for what we have. Instead, the show suggests that, rather than despair over the current reality, we should find humor in it and appreciate that even if we are alone, we can at least be alone together.